Aksoy, A., (1993), İşletme Sermayesi Yönetimi, Gazi Kitabevi, Ankara. Anthony, R. N. ve L. K. Pearlman, (1999), Essentials of Accounting, Prentice- Hall, New Jersey. Ballow, J. J., R. Burgman ve M. J. Molnar, (2004), “Managing for Shareholder Value: intangibles, future value and investment decisions”, Journal of Business Strategy, Vol. 25, No. 3, ss. 26–34. Black, A. P. Wright ve J. E. Bachman, (1998), In Search of Shareholder Value, Pitman, London, s. 17. Brooking, A., (1998), Intellectual Capital: core asset for the third millenium enterprise, International Thomson Business Press. Butterfield, L., (1999), “Advertising and Shareholder Value”, Excellence in Advertising,” Butterworth-Heinemann, Oxford, ss. 265–296. Davidow, W. H. ve M. S. Malone, (1992), The Virtual Corporation, Harper Collins, New York, ss. 11–22. Day, G. ve L. Fahey. (1988), "Valuing Market Strategies" Journal of Marketing, 52, ss. 45–57. Doyle, P., (2000), “Valuing Marketing’s Contribution”, European Management Journal, Vol. 18, No. 3, ss. 223–245. Drucker, P. F., (1993), The Practice of Management, Butterworth-Heinemann, Oxford, s. 36. Ecer, H. F. ve M. Canıtez, (2004), Pazarlama İlkeleri, Gazi Kitabevi, Ankara, s. 9. Ercan, M. K. ve Ü. 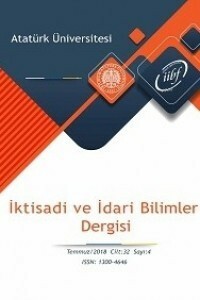 Ban, (2005), Değere Dayalı İşletme Finansı: Finansal Yönetim, Gazi Kitabevi, Ankara, s. 11. Ercan, M. K., B. Öztürk ve K. Demirgüneş, (2003), Değere Dayalı Yönetim ve Entellektüel Sermaye, Gazi Kitabevi, Ankara. Gallagher, R., (1998), “Returning To Your Customers”, Customer Value Management, New Zealand Ltd., http://www.cvm.co.nz. Kemperman, J. E. B. ve J. M. L. Van Engelen, (1999), “Operationalizing The Customer Value Concept”, Paper, EMAC Conference, Berlin. Koller, T., (1994), What Is Value Based Management, The McKinsey Quarterly, Number 3, New York. Kotler, P., (1994), Marketing Management, Englewood Cliffs, 1994, s. 19. Lukas, B. A., G. J. Whitwell ve P. Doyle, (2003), “How can a shareholder value approach improve marketing’s strategic influence?”, Journal of Business Research, 58, ss. 414–422. Lyotard, F. J., (1994), Post Modern Durum, Çiğdem, A. (Çev. ), Vadi Yayınları, Ankara, s. 11. McCarthy, B., (2004), “Instant gratification or long-term value? A Lesson in Enhancing Shareholder Wealth”, Journal of Business Strategy, Vol. 25, No. 4, ss. 10–17. McCole, P., (2004), “Refocusing marketing to reflect practice: the changing role of marketing for business”, Marketing Intelligence and Planning, Vol. 22, No. 5, ss. 531–539. Peppers, D. ve M. Rogers, (1997), Enterprise One-to-One, Piatkus, London. Pulic, Ante, (2003), “Do We Know If We Create or Destroy Value?”, www.measuring-ip.at. Pulic, A., (2004), “Measuring The Performance of Intellectual Potential in Knowledge Economy”, www.measuring-ip.at. Reichheld, F., (1996), The Loyalty Effect: The Hidden Force Behind Growth, Profits and Lasting Value, Harvard Business School, Boston. Seetharaman, A., H. H. B. Z. Sooria ve A. S. Saravan, (2002), “Intellectual Capital Accounting and Reporting in The Knowledge Economy”, Journal of Intellectual Capital, Vol. 3, No. 2, s. 128. Srivastava, R. K., T. A. Shervani ve L. Fahey, (1999), “Market-based Assets and Shareholder Value: a framework for analysis”, Journal of Marketing, 62, ss. 2–18. Sullivan, P., (2000), Value Driven Intellectual Capital: how to convert intangible assets into market value, John Wiley&Sons Press, New York. Urban, L. G. ve J. R. Hauser, (2004), “Listening in-to find and explore new combinations of customer needs”, Journal of Marketing, ss. 72–87. Van der Haar, J. W., R. M. Kemp ve O. Omta, (2001), “Creating Value That Can Not Be Copied”, Industrial Marketing Management, 30, ss. 627– 636. Walters, D. ve G. Lancaster, (1999), “Value-based marketing and its usefulness to customers”, Management Decision, 37/9, MCB University Press, ss. 697–708. Webster, F. E., (1997), “The Future Role of Marketing in The Organisation”, Cambridge Marketing Science Institute, ss.39-66. Welge, M. ve D. Holtbrugge, (1999), “International Management Under Post- modern Conditions”, Management International Review, ss. 305–320. ISNAD Külter, Banu , Demirgüneş, Kartal . "DEĞER TEMELLİ PAZARLAMA (Finansal Boyut ve Müşteri Boyutu)". Atatürk Üniversitesi İktisadi ve İdari Bilimler Dergisi 20 / 2 (November 2010): 327-342.